There is a reason “vacation blues” is a widely used phrase. People actually have it. Mine lasts only a day and that day is normally the day we are returning home: packing bags, rushing to the airport or to the car, making sure we make it on time. Saying goodbye to a beautiful time and place becomes hard when you can still see and feel it. I remember when I was a kid, the last day at my grandparents’ summer house always felt unbearable to me. I used to lock my eyes in sadness to the sea and think to myself “no! I will not see this sea until next year, another 9 months” and would memorize everything my eyes could see. I used to get up early, go for a swim and almost give kisses to the sea and hug it on the last day. I know, sounds silly but I love seasides! I am not a beach or poolside girl, I am a sea girl – have to be in contact with water at all times when I am at the beach. But, once I am back, I am back! That is why I can deal with Mondays easily, because I actually suffer on Sundays. As soon as we leave the place behind, I am more busy about the new projects I will tackle when I get back home. Or how I will complete many pending projects I have. So that is what I have been doing: Looking for a new(er) car, cleaning the kitchen cabinets, baking/cooking things here and there, and making a to-do list. Oh dear to-do lists! We decided to go easy on ourselves for dinners this week. Impromptu lamb chops marinated with fresh thyme, salt and pepper on the grill, accompanied with this cold cannellini bean salad, piyaz did it for us one night. Piyaz takes its rightful place on Turkish tables, especially if drinking raki is involved. 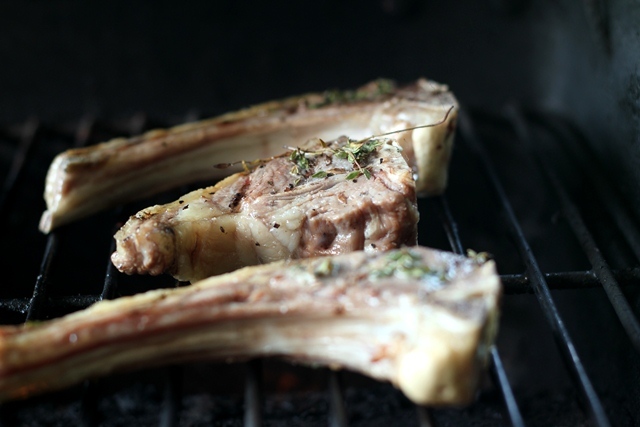 It is a light side dish or salad with a touch of red wine vinegar, sumac and sometimes dried mint. Every homecook will have their own version and additions: My mom adds finely chopped petite dill pickles and my grandma adds one or two hard boiled eggs, quartered and arranged nicely around the platter. You can add some ripe, chopped tomato if you want. I like to add fresh mint and skip on the dry mint while heavily relying on sumac for the tangy taste. I used cannellini beans but substitute navy beans if you like, as long as the beans stay firm when cooked thoroughly. Do you think it is too soon to plan another vacation? 1. Soak the beans in warm water for six hours or overnight.Afterwards, cook the beans with water on medium heat until they are done. 2. Once beans are cool, put them in a bowl. Add fresh herbs.Set aside. 3. Put the sliced onions in a small bowl big enough to get your hand in to knead the onions.Sprinkle 1 teaspoon salt and 1 teaspoon sumac over onion slices. Rub the spices on onion slices with your one hand.Onions should release some of their juice and lose their firm shape a bit. 4. Add onions to the beans. Whisk olive oil and vinegar. Add to the beans and stir to cover them well with the dressing. Add sumac, salt and pepper.Serve at room temperature or cold. Yay! This is the season for vacation. We’re leaving for ours in a week :) I have some dried navy beans. Shall make this though I personally prefer cannellini beans. No! It is never too late. I’m already planning my next vacation to Paris! Thanks for sharing, sweet friend. This looks perfect. I know those feelings! Every time we visit one of our favorite vacation places, I feel sad leaving it and hope that I will be able to return again. Anticipation of the next visit is a happy thought. 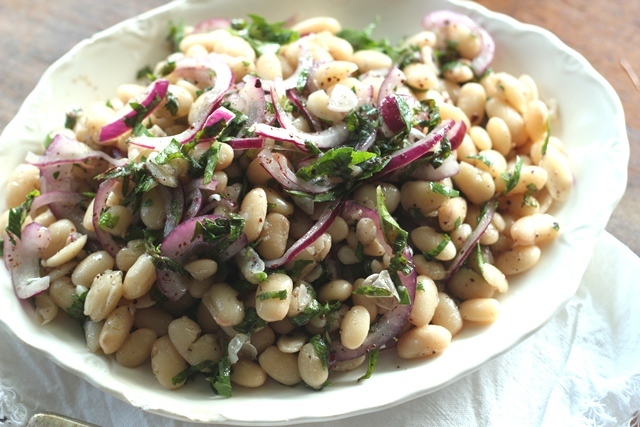 Wonderful bean salad and perfect partner to the grilled lamb chops! I soaked the beans in apple vinegar right after I cook them while they are hot. They absorb it better. I never tried with red wine vinegar, I will try. I think sumac is a nice addition, I will try that as well. I go with your grandma style, freshly cooked eggs and I add several black olives as well. It’s never too soon to plan another vacation! Sometimes I think I enjoy the planning as much as the vacation. Wonderful looking dish- it seems just about perfect for a light meal in the summer heat. Glad to hear you’re easing back into reality. I agree with everyone who said it’s never too soon to plan another vacation! This is a terrific dish. I do something similar though without the sumac and mint. You change the nature of the dish, but it’s also nice to fold in some sauted mushrooms. Good read – thanks. I think it’s never too soon to plan your next vacation, also think vacation blues are totally normal & a sign of a good vacation. So glad to find this bean salad. My husband &i recently tried these beans & found we really like them. I’ve been putting them in everything, but haven’t tried them cold. I do have to ask-I’m not a fan of mint fresh or dried & not familiar with sumac. Is there another fresh herb I can use? I love most fresh herbs & can you give me some info on sumac? Thanks can’t wait to try it. Deb, Sumac adds tangy flavor without making the dish too lemony.It is a bush in Mediterranean region and the berries of the bush is crushed. Sumac sometimes is wetted and used that way to release more flavor. You can add some lemon juice to your taste and see how it turns out. You can check the spice stores and Middle Eastern stores in your area or see online for sumac. Sometimes I shop at http://www.tulumba.com or http://www.bestturkishfood.com , depending on who has the most deals on items I want. Hope your vacation was lovely. I think there’s never a bad time to plan a vacation! :-D P.S. 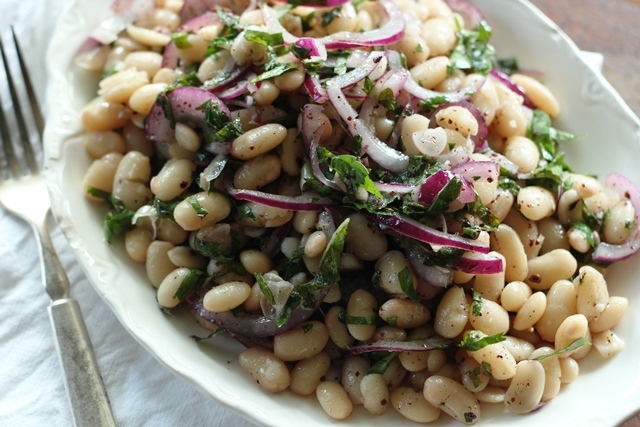 I adore cannellini beans and this looks delicious!